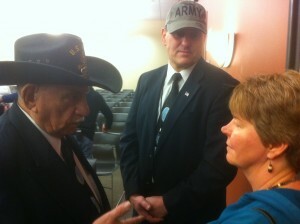 I met Army Veterans Angelo Diliberti and Andy Balafas at the Pillars of Honor program in Elgin honoring local veterans. These two gentleman shared a couple of their stories with me. Andy Balafas was a teenager when he joined the Army then decided to make a career of it. He was just 19 years old when he attended jump school. Andy is the first to admit that this program was physically taxing. During his career, he made an impressive 7 jumps. Angelo Diliberti also attended jump school, though not until he was 47 years old. In his long career in Special Forces, he completed over 100 jumps. Angelo’s most memorable jump occurred during a demonstration at Cantigny with the Airborne Reserves. A sudden wind gust yanked his parachute off course in the cramped drop zone and he found himself dangling with his shoot entangled in the trees. Angelo attended President Eisenhower‘s funeral, attending to General Omar Bradley for the week. 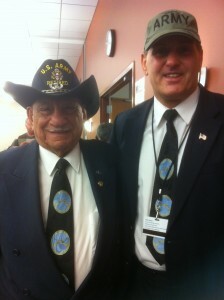 Angelo is Commander of the St. Charles Amvet’s Post and a member of the Amvet’s District staff. Thanks to all our veterans and service people who protect our country.